PACBI-IPSC "Irish artists' pledge to boycott Israel"
IPSC "Irish artists' pledge to boycott Israel"
"In response to the call from Palestinian civil society for a cultural boycott of Israel, we pledge not to avail of any invitation to perform or exhibit in Israel, nor to accept any funding from any institution linked to the government of Israel, until such time as Israel complies with international law and universal principles of human rights." - See the full list of signatories here. Described by the Palestinian Campaign for the Academic and Cultural Boycott of Israel (PACBI) as "a ground-breaking initiative", this pledge has so far been signed by over 140 Irish creative and performing artists: novelists, playwrights, poets, actors, composers, singers, dancers, painters, sculptors and filmmakers, ranging from those starting out on their careers to household names. - See here for the full PACBI statement of endorsement. According to IPSC Cultural Boycott Officer Dr. Raymond Deane, "These artists are aware of the Israeli Foreign Ministry's statement in 2005 that “We see culture as a propaganda tool of the first rank, and...do not differentiate between propaganda and culture.” These artists refuse to allow their art to be exploited by an apartheid state that disregards international law and universal principles of human rights, but look forward to the day when normal cultural relations can be re-established with an Israel that fully complies with such laws and principles." Dr. Deane, himself a classical composer and a signatory of the pledge, recalled Nelson Mandela's dictum that "boycott is not a principle, it is a tactic depending upon circumstances." Dr. Deane added: "Five years ago, when 170 Palestinian civil society organisations called a campaign of Boycott, Divestment and Sanctions (BDS) against Israel, they provided a central plank for worldwide activism on behalf of their cause." Dr. Deane continued, "Culture cannot stand aloof from such activism. Whether or not art is 'above politics', its presentation and representation in the real world can all too easily be hijacked by oppressive states. With this pledge, Irish artists have an opportunity to distance themselves from such exploitation, and to take a non-violent stand on behalf of the oppressed Palestinian people." John W. Sexton – Poet. 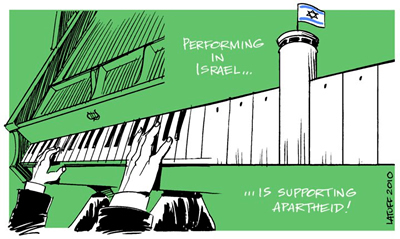 The Palestinian Campaign for the Academic and Cultural Boycott of Israel (PACBI) strongly welcomes the Irish artists’ 'pledge’ to boycott Israeli cultural institutions until Israel complies with international law. This pledge not only represents a significant victory for the ethical responsibilities of international cultural figures; a key factor in the cultural boycott of Israel, but is a ground breaking strategy in supporting Palestinian struggle for freedom and justice. In the last few years, many international cultural figures have come out in support of the cultural boycott of Israel. A statement authored by John Berger in support of the boycott gathered dozens of signatures, including some celebrities. Montreal, Canada, witnessed a most impressive initiative in this respect, where 500 artists issued a statement this last February committing themselves to “fighting against [Israeli] apartheid” and calling upon “all artists and cultural producers across the country and around the world to adopt a similar position in this global struggle” for Palestinian rights. Yet, the Irish artists have raised the bar of solidarity by pioneering the first nation-wide cultural stance in support of the boycott of Israel. Inspired by the South African anti-apartheid cultural boycott, the Palestinian academic and cultural boycott call  has relied entirely on moral pressure, appealing to the conscience of the artists in question as well as their fans. The main rationale behind this call is that performing in a state that practices occupation, colonization and apartheid, as Israel does, cannot be regarded as a purely artistic act, if any such act exists. Regardless of intentions, such an act is a conscious form of complicity that is manipulated by Israel in its frantic efforts to whitewash its persistent violations of international law and Palestinian rights. This is because artistic performances in Israel promote a “business as usual” attitude that normalizes and sanitizes a state that has persistently committed war crimes over several decades -- in Gaza, Jerusalem, the Naqab (Negev), and most recently, in the high seas against international humanitarian relief workers aboard the Freedom Flotilla. An artist who performs in Israel today -- just like any artist who violated the boycott and performed in Sun City, South Africa, during apartheid -- can only be seen by Palestinians and people of conscience around the world as motivated by profit and personal gain far more than by moral principles. We realize that Israeli concert promoters offer large sums of money to lure international performers as part of the Foreign Ministry-run “Brand Israel” campaign, designed explicitly to hide Israel’s criminal violations of human rights under a guise of artistic and scientific glamour and a deceptive image of cultural excellence and “liberalism.” But we hope artists will resist the temptation and assert the primacy of human rights and justice over financial reward. Within this context, the main impact of the boycott at this stage is to expose Israel as a pariah, to increase its isolation, thus raising the price of its injustices against the Palestinian people and challenging international complicity in perpetuating its occupation and apartheid. The Palestinian academic and cultural boycott movement has not witnessed a sustained surge in cultural boycott of Israel such as has occurred in the last year and a half, since the Israeli war of aggression on Gaza. Today, major performing artists are cancelling concerts in Israel and world bestselling authors are endorsing BDS. With this growth, the movement is showing more signs of its potential to transform international opinion in much the way that the divestment movement isolated the South African apartheid regime. In 1965, the American Committee on Africa, following the lead of prominent British arts associations, sponsored a historic declaration against South African apartheid, signed by more than 60 cultural personalities. It read: "We say no to apartheid. We take this pledge in solemn resolve to refuse any encouragement of, or indeed, any professional association with the present Republic of South Africa, this until the day when all its people shall equally enjoy the educational and cultural advantages of that rich and beautiful land." A year before that, in 1964, the Irish Anti-Apartheid Movement promoted a declaration signed by 28 Irish playwrights that they would not permit their work to be performed before segregated audiences in South Africa. Today, Irish and Canadian artists have opened up the way for achieving the same level of commitment from international artists in isolating apartheid Israel. The great majority of Palestinian cultural figures stand solidly behind the call for a cultural boycott of Israel,  as do all the main cultural institutions and associations. Palestinian artists often express the commonly held view that world artists have a moral obligation to uphold universal principles of human rights and justice in order to help end this multi-tiered oppression against the Palestinians. Irish artists have today taken a historic step in enhancing the movement that would exert effective pressure on Israel and bring about freedom and just peace. For that, we salute these principled and ethically responsible Irish artists.